The tiny hamlet of Vanessa, Ontario (Population 80) and Joanne McMurchy's convenience store is ground zero for an outpouring of public support that has led to the largest single petition collected in Ontario. The petition calls on the Ontario Legislature to broaden Ontario's current alcohol retailing system to include convenience stores. McMurchy, a former health care worker and teacher, and proprietor of the Vanessa General Store has constantly heard customers ask when they would get what most other Canadians enjoy - something as simple as picking up a bottle of wine or some beer at their local convenience store. So she started a petition. Today that petition, which swelled to 112,500 names collected from 220 communities across the province, was unveiled at Queen's Park. "The alcohol retailing system in Ontario was designed in 1927 - 85 years ago - and hasn't fundamentally changed. But Ontarians are now speaking loud and clear: It's time we moved the discussion forward on modernizing alcohol retailing in Ontario to include convenience stores," said Dave Bryans, CEO, Ontario Convenience Stores Association (OCSA). "The people who have signed this petition are New Democrats, Liberals and Conservatives. They're parents, neighbours and responsible adults who want the same simple convenience that their friends and relatives outside Ontario enjoy. Convenience stores are already responsibly offering alcohol in over 200 communities and it's time to add on to the existing system with more options for consumers." The petition, which was collected over the course of four weeks in late 2011, is the latest evidence of the widespread support for modernizing Ontario's alcohol retailing system to include convenience stores. 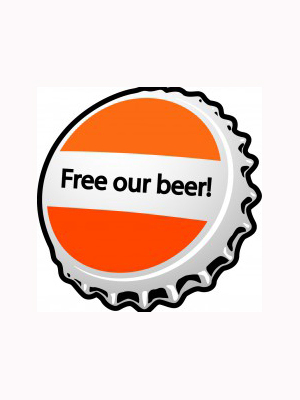 People can still sign the petition and view the full list of cities that took part at www.freeourbeer.ca. "Customers kept saying it would be nice to be able to buy beer or wine at our store. I decided to draw up a petition and before I knew it, pages and pages kept filling up with names of neighbours, friends, and customers who all wanted this simple convenience. People were stopping at the store just to sign the petition!," said, Joanne McMurchy, Owner,Vanessa General Store - the location where the petition began. "Our store is one of the central places in our community and people come here to buy everything from food to hardware, yet they have to drive 20 minutes to get a bottle of wine for dinner. They keep telling me it's time for change." Ontario Convenience Store Association members are responsible community retailers. We sell more age restricted products than any other retailer, and do a better job of checking for age than any other retailer. Last May the OCSA unveiled an independent, third-party mystery shopping study that showed convenience stores were the best at age checks -- better at denying sales of age-restricted products to minors than the foreign-owned Beer Store and the government-run LCBO. In August, 2011, OCSA also released an Ipsos Reid study that revealed that two-thirds of Ontarians who shop at the foreign-owned Beer Store and government-run LCBO want the convenience of alcohol retailing at convenience stores.